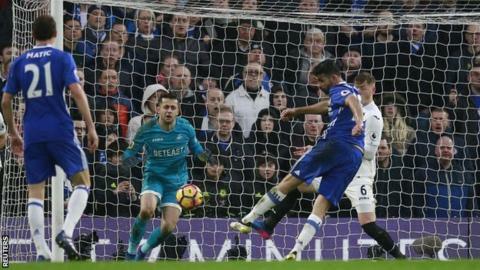 While it required an error from Fabianski to restore the lead, Eden Hazard’s exquisite timing and pass for Costa to make it 3-1 was a delight. Chelsea were forced to work hard for three points thanks to a well organised and energetic Swansea side and the Swans looked a shadow of the team that was bottom of the Premier League table five weeks ago. Their four-point safety cushion at the start of the day is down to three, but boss Paul Clement will have been pleased with the way his side frustrated the runaway leaders for long spells. Llorente’s equaliser shook Chelsea who were showing signs of frustration before Pedro made it 2-1. Swansea’s next four games – Burnley (home), Hull City (away), Bournemouth (away) and Middlesbrough (home) – give them a chance to stay clear of the bottom three before they entertain Tottenham on 4 April. Chelsea manager Antonio Conte: “We played very well, it was a good performance, and we created many chances to score. We conceded at the end of the first half, after the time was finished, so in this case there was a bit of luck, but we showed great character in the second half. Swansea City boss Paul Clement: “Any game we play and don’t win we are disappointed. Chelsea are a very good side, they have fantastic quality and that was the difference. We didn’t have a lot of chances but we came in at 1-1 for half-time and for long periods we defended really well. Ex-England captain Alan Shearer: “I think it was a penalty. I think it was a deliberate movement of his hand towards the ball and I think Chelsea got away with one there. It could have been very different if the ref had given it. “We’ve seen in recent weeks with Swansea that they made it very difficult for Liverpool at Anfield, they were unlucky to lose at Manchester City. They are very organised. The difference between Liverpool and City with this Chelsea side is the pace with which they go forward. That’s why Cesc Fabregas was in the team today. He was brilliant. He’s the one that started the goal off. No player has more assists in the Premier League this season than Gylfi Sigurdsson (nine, level with Kevin de Bruyne). Chelsea conceded in consecutive home league games for the first time under Antonio Conte. Swansea have conceded 26 goals in their past 10 Premier League away games, an average of 2.6 per game. Fernando Llorente has scored nine goals in all competitions this season for Swansea, three with his head, three with his left foot and three with his right. Chelsea have nine days to prepare for their next game away to West Ham United on Monday, 6 March (20:00 GMT). Swansea entertain Burnley on Saturday, 4 March (15:00 GMT).